Regardless, what is clear at this point is that there are a number of significant changes that are coming down the pipe for the FX brokerages. While I myself am no legal expert, I wanted to share with you my opinion about one very important change that MiFID II regulation is bringing to the world of retail FX, based on my understanding after reading the subject matter. 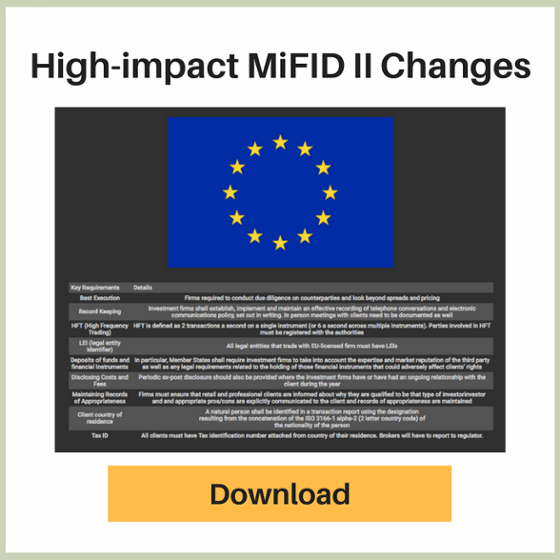 The primary goal of MiFID II is to bring transparency into the financial markets, and with that comes certain standards that all regulated financial firms in Europe will need to abide by. The focus on reporting was particularly interesting to me. 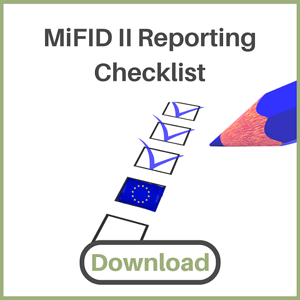 The MiFID II reporting framework is building on EMIR reporting and includes additional information that EU regulated firms will be required to submit to a central data repository on a daily basis. “send a notice to the client in a durable medium confirming execution of the order as soon as possible and no later than the first business day following execution or, where the confirmation is received by the investment firm from a third party, no later than the first business day following receipt of the confirmation from the third party. (p) where the client's counterparty was the investment firm itself or any person in the investment firm's group or another client of the investment firm, the fact that this was the case unless the order was executed through a trading system that facilitates anonymous trading." "(k), where the order is executed in tranches, the investment firm may supply the client with information about the price of each tranche or the average price." FX is a very fragmented OTC market. Most brokers build in additional markups to their pricing and these may vary by client or by group of clients. The requirement to disclose the amount of that markup to the client upon request is a total game changer. Currently, none of the retail FX firms is under any obligation to report who executed, or handled, a client’s transaction; basically they don’t have to disclose whether that transaction was sent to the market or taken by the broker on its own books. Under MiFID II, the firm is required to disclose whether they took the trade themselves, or sent it through to the market for execution. This may significantly change modus operandi for the marketing departments of many FX firms, particularly those who base their marketing strategies around a certain execution model (Prime of Prime, ECN, STP, NDD etc). If a client’s order was executed with multiple fills, you may be asked to show that to the client and explain the logic VWAP (volume weighted average price) trade execution. How complicated is it for FX brokers to implement these requirements? I think a lot depends on the current business model of the FX brokerage and the marketing strategy employed. This extra layer of transparency is great for the market overall, but may require a significant amount of time and resources to implement. The adoption of these new rules will affect multiple departments within each brokerage, from compliance and marketing right through to IT and risk management. *This is NOT a legal opinion.